Greek Default Watch: Is Greece Still a Democracy? Is Greece Still a Democracy? The "debate" in Greece over the troika overstepping its bounds would be comical if it were not so tragic. To accuse the troika of “meddling in domestic affairs” while cashing its checks, or to claim that the government only "takes its directives from the Greek people" when all legislative initiatives are vetted by the foreign "bureaucrats" despite loud protests by the "Greek people" - none of these claims are serious. Greece may have not declared bankruptcy (yet), but it is at best in receivership, kept afloat by generosity (and self-interest) provided it can reform. Yet beside the comical theatrics lurks a deep question: is Greece still a democracy? Not only is the answer "yes" but, in many ways, Greece is more democratic now than at any point in its recent history. After 1981, legitimacy grew but incomes stagnated. Papas, again, puts it well: “PASOK’s basic contribution to Greek politics was to take the old clientelistic structure of control and reward and ‘massify’ it.” Government spending soared to buy the political support of those groups hitherto prosecuted. Democracy deepened, and politics became more pluralistic. But the cost of that legitimacy was a bloated public sector and a wrecked economy. 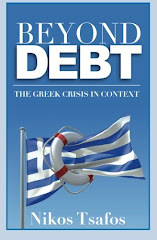 Greece bought democracy with borrowed money (see here). In the 1990s, the economy achieved relative macroeconomic stability but with only a modest rise in incomes. Indicators improved faster than livelihoods. Democracy, however, took deeper roots. After the adoption of the euro, incomes started growing more rapidly, but after 2004, so did government spending and fiscal deficits. Growth was strong but increasingly unsustainable. All this provides a useful contextual point: rarely have Greek governments been able to deepen their legitimacy by appealing to broad based economic growth - instead they have usually purchased loyalty at the expense of sensible, long-term planning. Greece's political challenge is massive in this respect: how to convert political loyalty and identification from a clientelistic system that is largely based on patronage to a system where broad-based economic policy helps define political orientation. Or put more simply: when will Greek citizens vote for a government because of what it can do for all Greeks, rather than what it can do for them alone? Go back to the initial question: is Greece still a democracy? In the IMF era, the government is sovereign in important ways: it still enjoys a public mandate, it was voted into office just over a year ago and it retains a parliamentary majority. It even survived a vote in local elections late last year, and no opposition force can claim a greater mandate. Whatever the Greek people may be feeling, the government represents that, at least partly. And in no way are freedoms curtailed – this is no autocracy. Yet economic policymaking has clearly shifted from the government to a joint council between the Ministry of Finance and the troika. Wage cuts, pension reform, VAT increases, public sector accounting and accountability, privatizations, administrative simplification, the opening of closed professions and the liberalization of product markets - in none of these is the Greek government alone in deciding what course to take. In fact, even protestors have realized that protesting can be futile – neither does the government care nor would it matter if it did. In economic policy, it is an executor, not an architect. How can Greece be considered a democracy if all meaningful decisions are made by a handful of bureaucrats, half of whom are neither Greek citizens nor elected by the public? Even if one sees the Memorandum as the act of a government democratically elected, the changes under way are far beyond any considered during the October 2009 elections. No one voted for these changes in 2009. Yet what is a democracy anyway? If conceived narrowly - elected representatives governing the country according to the will of the people - then Greece fails the democracy test in many ways. But if democracy is something deeper, then Greece is in fact more democratic now than in the past. Yes, the rights of truckers or seamen or lawyers or doctors or pharmacists are being curtailed - but who said they should have had those rights to begin with? Why have a “right” to restrict competition in your profession and coerce me, the consumer, to pay you more than I have to. What “right” does the public sector employee have to get paid twice as much for half the work? These are not rights in any real sense - they are political abuses, perpetuated by politicians whose chief purpose is re-election for the sake of power and enrichment. Democracy means not just representative elections but checks and balances. At no point in the past half century has there been a true counter-balance to the power of the state. Its growth has been unchecked, and in the process it either taxed its citizens or borrowed on their behalf. It did so to enrich its politicians and its cronies. This reform agenda is no freedom curtailed. The troika is the “check and balance” to state power gone wild. It is not flawless nor fully accountable. Yet an imperfect troika has changed more in six months than imperfect Greek governments have in decades. And that's the most a democracy can ever hope for. As a Greek, Nikos, you would know that the word 'democracy' implies a regime in which the 'strength/power' (kratos) is vested in the 'people' (demos). In a way, it is not a bad thing that Greece is becoming more of a republic and less of a democracy, i.e. is becoming less responsive to popular demands. In contrasts, a republic, as you also know, is a regime in which those who deal in the res publica (loosely: 'public affairs') are nominated and can be recalled. Good appointees in republics make policy as though they will never again need to stand for election - i.e. with indifference to public perception but in consideration of the best course in public affairs (very SAIS-style bureaucratic tyranny, I know, but so what?). I always teach my students that representatives are named as such because their job is to 'represent' the people - but not to 'reflect' their wishes or check in with them regularly. Elections are the only time at which representatives are accountable to the demos. The rest of the time they're liable only to the law. At least that's how Edmund Burke understood things (see: 'Speech to the electors at Bristol' or something like that). Greece's leaders, to their credit, are following the Edmund Burke model. Evidently, a little bit less democracy and more republicanism in Greece is not so bad. I knew I was bound to get into some kind of democracy vs. republic trouble with this post. Of course you are absolutely correct in your observations. What is interesting (and perhaps, in this context, telling) is that the Greek language does not distinguish between the two. The official name of the Greek state is "Ελληνική Δημοκρατία" (Hellenic Democracy) which is translated into "Hellenic Republic." You say: " Greece's leaders to their credit ... " You gotta be kidding right ?! Greece's leaders HAVE NO CREDIT and neither do their voters. Even before the Greek Colonel's Military Junta, politicians have religiously screwed all social, political, and economic foundations in Greece by putting their own personal fortunes and those of their families ahead of their duties to their citizens. Shame ! I am finding your posts so helpful for my Political Economy class at the University of Washington. Can you tell me what you mean when you say that half the bureaucrats aren't citizens of Greece? Do you mean the involvement of the EU and IMF officials? Or do you mean the politicians? If you mean the politicians, what are their origins?